We are excited to start mining Spreedly's data - we have quite a lot of it - to surface interesting insights, trends, and if possible actionable results for merchants, payment gateways, and even consumers. While perhaps not as flashy as data science at a dating company, it should be safer to read at work, and we suspect there are a lot of kindred souls that find payments data as interesting as we do. Who doesn't like getting better at making money? In a series of blog posts, we will use data analytics to address challenges our customers deal with that might also be of broader interest to the e-commerce and payments industry. 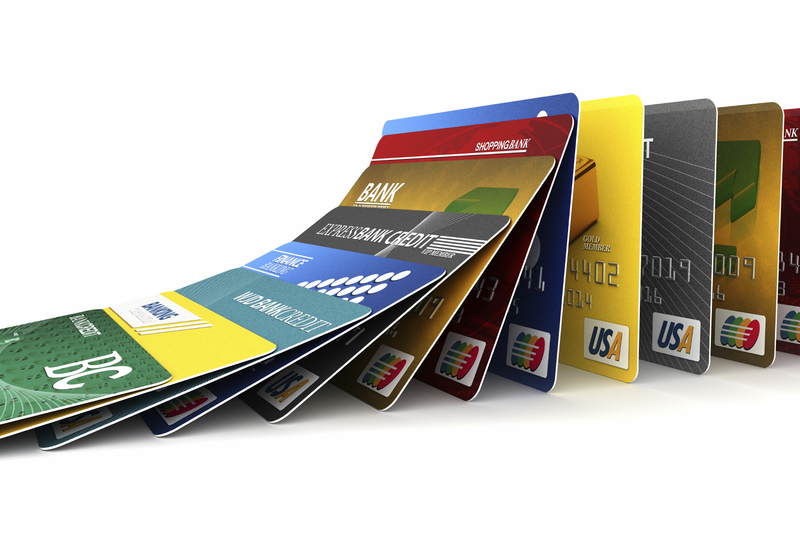 What is the average lifetime of a credit card? Should companies, particularly subscription or "one click payment" e-commerce services, care about card types (i.e. Visa vs. MasterCard)? What can companies do to keep their vaulted payment methods clean and up to date? How do you reduce credit card decline rates? Our first foray is in an area near and dear to subscription-based companies: customer churn related to lost, stolen, or expired cards. Services like Visa's North American Account Updater can help with the problem, but they don't cover all brands in all regions. So, what measures can merchants take to reduce credit card declines to improve their churn? There are a number of different approaches, but for this post we want to focus on one particular area: the average expiration expectancy of a credit card once it hits the Spreedly vault. Expiring cards are a big driver of revenue churn and customer support/sales costs - no one likes chasing down customers for an updated card - and so understanding how cards expire may help us design for renewal success from day one. As a startup, the pace at which cards are being stored in Spreedly is accelerating rapidly. In fact, 70% of all the cards stored in our vault have been added in just the last 12 months. That means we should represent a pretty "fresh" batch of cards when looking at our vault. One notable exception we'll caveat is that we do imports from other payment providers on behalf of merchants; in such cases we're inheriting a set of data into our vault that is of unknown age. 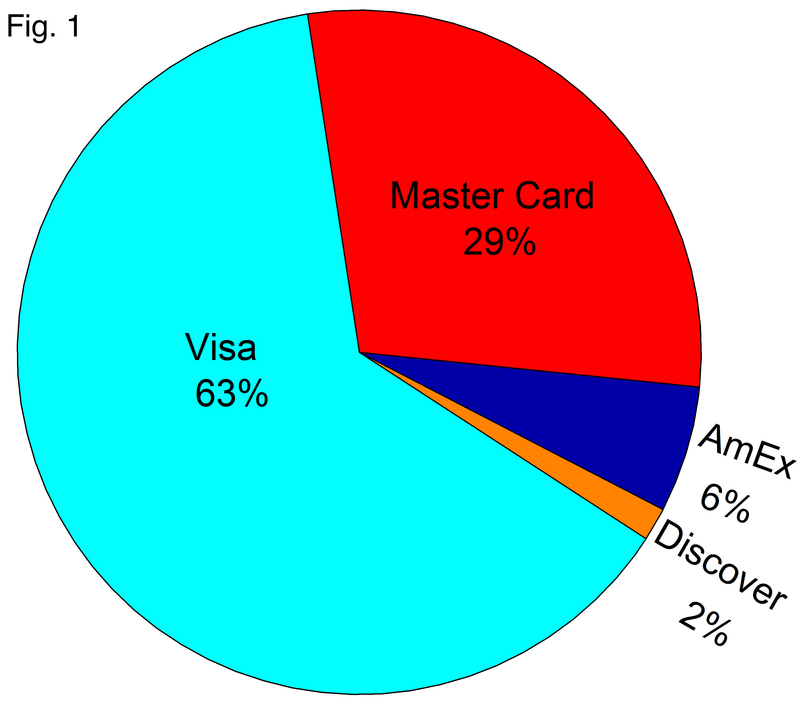 In Spreedly's vault, Visa is the dominant card type (Figure 1). Visa cards comprise 63% of credit cards stored. MasterCard has 29% with American Express (denoted as AmEx in figures) at 6% and Discover card 2%. Even with our "fresh" vault, millions of these cards will expire in the next 24 months. 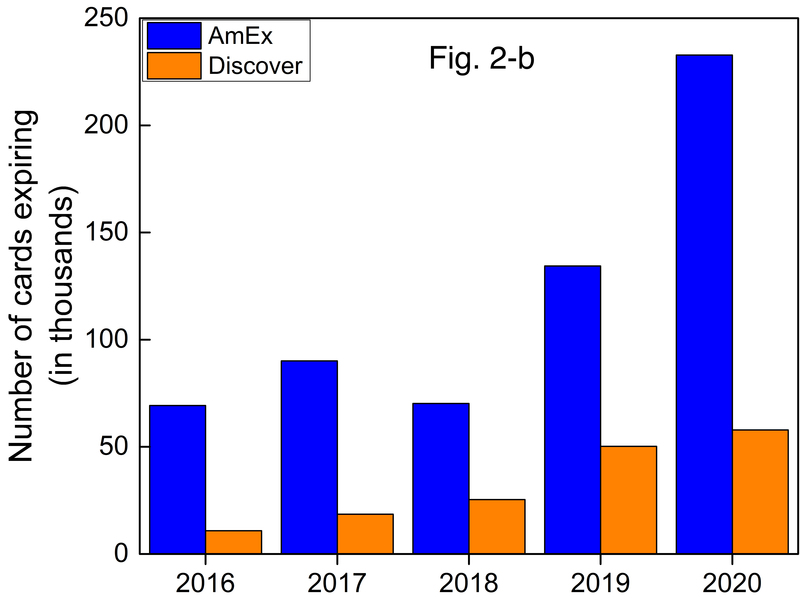 Figures 2a and 2b demonstrates the total number of cards in the next 4 years: just in in 2017 and 2018 alone more than 4 million cards in Spreedly's vault will expire. The bad news for our merchants is that not all cards are created equal! In fact the bulk of Visa and MasterCard brands in our vault expire in 2017 and 2018. 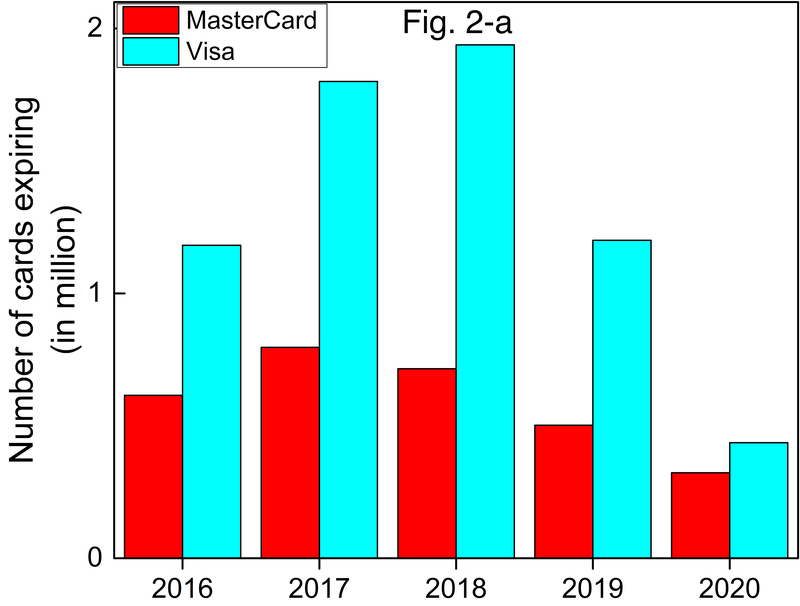 MasterCard expirations peak in 2017 while Visa peaks in 2018. So the average expiration expectancy of a MasterCard stored in Spreedly is ~14 months while for Visa it's ~ 21 months. We can see a much longer expiration expectancy for the other brands we're evaluating: ~ 34 months for American Express and ~35 months for Discover. This indicates that merchants should be less concerned about interrupted subscriptions due to expiring cards with customers using those brands. Meanwhile, merchants with more Visa and MasterCard branded cards may want to consider action to guarantee continued and uninterrupted service to their customers. One of the most interesting things we found out of this specific analysis is that it calls into question the common belief that merchants should encourage customers to use credit cards with lower fees. For example, many merchants discourage usage of American Express cards due to the fact that there are higher processing fees associated with those cards vs. the more common Visa and MasterCard. Subscription or repeat commerce services that have employed that strategy may wish to revisit it - after confirming with their internal data - since those lower processing costs could be coming at the expense of customer churn. We think it's important to point out that to the best of our knowledge there is not a fixed range between issuing and expiration dates and the expiration dates for credit card companies are determined based on a variety of parameters including the applicant's credit worthiness. Consequently, one cannot deduce a general rule that American Express and Discover have longer life expectancy than the other two; rather, we're only noting interesting trends in Spreedly's data set. Having looked at how long until an average card expires, we wondered if there might be any other trends around expiration that could help merchants better manage their vaults. What we found is that there are distinct patterns around which months cards expire in. For each credit card type, figure 3 shows the ratio of the total number of that type expiring at a particular month per its total number in Spreedly's vault. It appears the expiration months tend to peak twice a year at 6 month intervals: Visa and MasterCard both peak in March and October, while Discover peeks in May and November. The least fluctuation in expiration month belongs to American Express which drops down from ~9% per month for the first couple of months to less than 8% for May to December. Another noticeable fact is the downward trend of cards expiring in December. While 11% of Discover cards expires in May, this ratio bottoms down at 4% in December. We observe a similar trend for Visa and MasterCard: the smallest percentage of expirations takes place in December. Does this reflect a credit card issuer strategy to avoid masses of expired cards in the biggest shopping season of the year? We hope to further examine this question as Spreedly's dataset continues to grow. 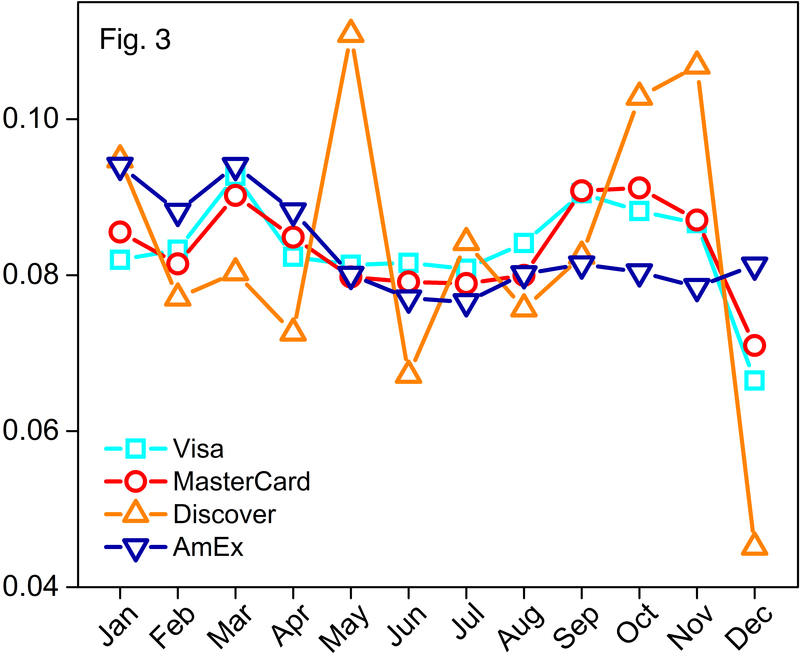 The data in Figure 3 suggest that first, subscription businesses - particularly venture funded startups and public companies - should consider seasonal and/or monthly adjustments to their churn based on the underlying activity of expiring cards. Second, services that proactively work to reduce churn should consider allocating resources differently, for example, for the month of March vs. the month of July. Both of these points are particularly true if there is a large percentage of Visa and MasterCard data within your vault. If you enjoyed this post, please do share it on social media! Meanwhile, our data scientist would love to hear from you directly via email: shoresh@spreedly.com will land right in his inbox.